1. In a kadai, boil beans, carrot, cabbage and capsicum with enough salt and water. 2. Fry oats for 2 minutes and keep it aside. 3. In a frying pan, put 2 tsp oil. 4. Add mustard, urad dal, channa dal and red chillies and fry till the dals turn brown. 5. Add chopped onion, curry leaves and asafoetida and fry till the onion becomes soft. 6. Add chopped tomato and fry till it gets cooked. 7. Add one and quarter cup of water and enough salt. 8. When water starts boiling, add the cooked vegetables and fried oats and stir well. 9. Lower the heat and cover the pan with a lid allowing it to get completely cooked and all the water is dried. 10. 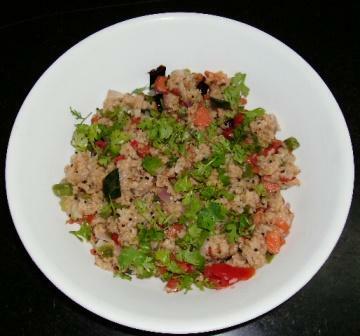 Garnish with coriander leaves and serve hot along with coconut, coriander chutney.